This year has seen the publishing of my 2nd book Volitional Attention Training – Neural Plasticity and Combative Application – below is another exract from the book, enjoy the read. Consider this very straightforward question, what is the difference between the mind and the brain? Which one of these is responsible for that feeling that, something is just not right? You know that thing that we call gut, our instincts, those that we believe have protected us at some time in our long forgotten history, allowing us to survive the predators of that time. 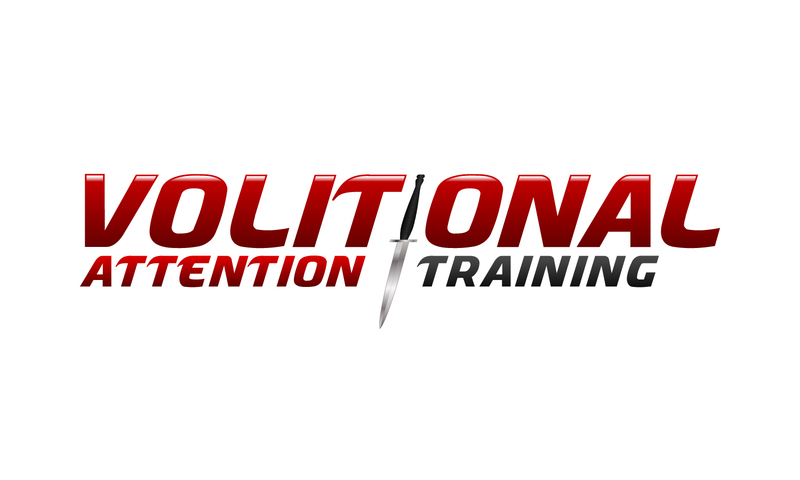 To enable an individual to commit to training, they have to be secure in the knowledge that what they are about to undertake will provide them with the desired outcome and in today’s environment, that is coping with the predators that walk our street, the thugs and petty criminals being in the wrong place at the wrong time or the professional that has to deal with these feelings on a day to day, month to month basis. I remember talking with a US ranger, retired special forces guy, you know the type of person that films are made of, one that has at every turn in the road stepped forward to go where most fear to tread, I remember clearly his words “I ignored my instincts nine times and each time, I was either shot or stabbed”. Any training that is maladaptive or does not contain procedures that tap into this long forgotten sixth sense may ultimately fall short. If your training includes an understanding of instincts, what they are, how to recognise them, what they are not, then you are again on the path to a personal understanding, that uses the most powerful tool in our armory, that which has been responsible for dragging us along that evolutionary road to today’s modern man, the human brain and the mind that lies within. To start this process we first have to go way back, to the first society that proposed the hypothesis of two brains. The first people to propose this were the ancient Greeks. It’s obviously not two brains just two systems and for a change they are named system one and system two, they are also known as ‘Dual Processing systems’. In his book the Science of Fear Gardener (2008) used the term ‘head’ and ‘gut’ to explore the thought processes that are used by the two systems, as they are distinctly different. These terms are very appropriate to this discourse and so I will use them here as well. System two is labeled, “Head” and is responsible for reason, this is our conscious mind the one that we engage when we consider a situation, it works at a much slower pace than gut, taking its time to calculate, consider, working with logic and what it believes is the correct thought or answer. System one is labeled “Gut”, this is our subconscious mind at work, which is directly linked to our evolutionary past and is responsible for our survival and development to this day. Unlike system two, system one is super quick, it creates thought and transfers this to our conscious mind in a split second, gut has no time for the slow processes that Head has to work with. Gut is the source for the feelings of fear, unease, it makes the hairs stand up on the back of your neck it triggers your fight or flight response. The US ranger story above is an example of system one sending signals from the subconscious mind, warning you that there is something not quite right with the situation, Head then gets involved and considers the situation, allowing time for the Head to over-rule the Gut and in the case of my friend above nearly costing him his life. “The idea that System 1 cognition is ancient and System 2 cognition is modern, in evolutionary terms, is a recurring theme in dual-process theories. This is often linked to the assertion that while System 1 cognition is shared with other animals, System 2 cognition is uniquely human. The last idea arises from its association with uniquely human processes such as language and reflective consciousness and the apparent ability to perform cognitive acts (such as hypothetical simulation of future and counterfactual possibilities) that are assumed to be beyond animals” Evans J (2006). One thing is very clear, system one is linked to thoughts that are produced almost instantly and the evidence suggests that this system is part of the mechanism that our long lost stone age ancestors used to alert them to impending danger, or when they were the main course on the menu. This system would have been selected over and above system two as an evolutionary adaptation, to enhance survival. Now, modern man is the safest he has ever been and does not usually find himself being hunted for dinner, he now has more distractions for Head to think about and the need for system two is no longer a critical mechanism. Head all to often interrupts Gut and provides a logical reason why there is no danger around the corner. However this does not mean that it will be lost, far from it, this is the system that kicks in when we walk down a dark ally, hear a strange noise in the dead of night, or maybe you are a professional officer and are about to enter a building that you know may contain danger and you feel uneasy. Understanding how these two systems interact with each other is another key in the process to protecting oneself and family. System one uses a quick and simple way of producing thoughts, which we usually refer to as instincts, the process is straightforward and super fast. Knowledge obtained by Head can transfer to Gut, a novice martial artist learning to strike and kick or a policeman learning to handcuff or draw and shoot, first finds the moves cumbersome and slow, having to continually practice the moves, paying attention to each step in the process, secure one arm with my left hand, reach and find my cuffs with my right, flip them open, snap one side onto the wrist. Continued training and practice, for extended periods of time wires the mental and physical process into the brain, you then come to a point where conscious thought is no longer necessary, you are capable of flowing through the process with speed and accuracy, the process has been internalised, or to put it another way, it has become spontaneous. Interestingly, if at this stage, we were to apply volitional attention to the process, the now fast and spontaneous process would be interrupted and slowed, creating a possible choke point in the learned behaviour. So system one “Gut” is intuitive, quick and emotional. Gut decides instantly while Head thinks about it for a while, and then finally after life changing seconds have ticked by makes a decision. Gut uses inbuilt settings that are simple rules of thumb, these are hard wired neural pathways that fire when certain stimuli are presented, which natural selection hard wired into our subconscious innate brains a millennium ago, this system does not allow Gut to adjust in any way; it does not give us time to think! These rules of thumb are known as heuristics and biases, they are the brain’s way of processing stimuli at lightning speed, insuring that Head does not get involved, putting at risk the survival of the individual. Gardener, D. (2008). The science of fear. Published July 17th 2008 by Dutton Adult. 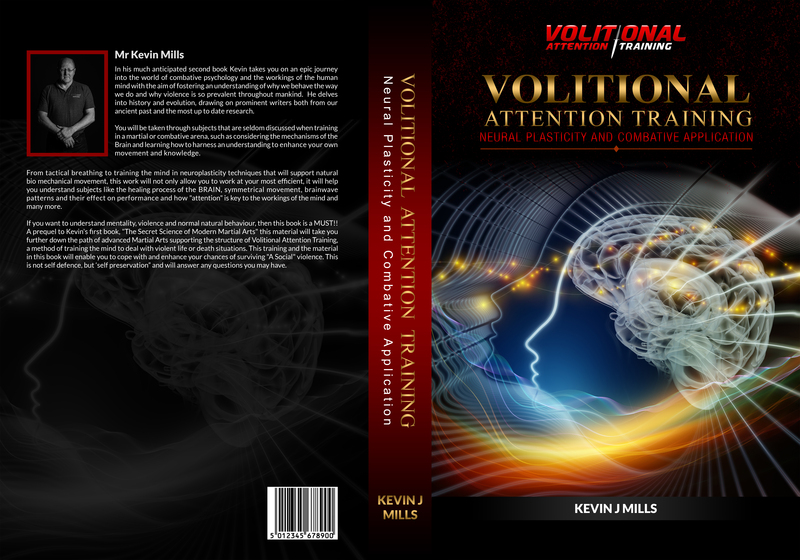 Here is the first preview of my new book Volitional Attention Training. Over the coming months I will upload a few more samples. What is attention or mental force, how does it create neural activity and what are its benefits? “The task is not so much to see what none have yet seen, but to think what nobody has yet thought, about that which everybody sees” Schrodinger, E.
The hardest attribute to relay to any student of the martial arts is not found in the physical realm, but rather the mindful application of “mental force” Schwartz and Begley (2002), which all humans are capable of harnessing. This mental force comes in all manner of forms and descriptions, indominatable spirit, warrior mind and attitude, are all examples of these. However, a more important question should be, how is this state of mind achieved, and what processes occur within the mind and the brain? To help answer these questions will require an understanding of an area of science and physiology not often explored, namely that of mental thought processes that create will power or volitional effort. “Volitional Effort” is effort of attention, the function of the effort is to keep affirming and adopting a thought, that if left to itself would slip away, effort of attention is thus the essential phenomenon of will” James, W. (1890). There are a few individuals in whom this type of mental force seems to be present in abundance, then there are those, and these are in the majority, that do not possess this mental force in any way. They have been molded over their lifespan through behaviour and an exposure to either a physical experience of violence or a thought process that never required them to engage in what could be termed aggressive thoughts or the ability to use will power to overcome a stressful situation. In essence, psychological skills are required to help support physical skills. Mental toughness, mental force and attitude of mind need to be explored and defined. This involves two specific areas: – 1, the actual processes that are taking place within the brain; and 2, the mind’s ability to channel attention and mental force. There are individuals that seem to possess these abilities in abundance, if this is the case, important questions would be, how did this attitude of mind develop and is this the product of behaviour and social identity created by circumstance? Children, directly as a result of significant caregiver roles within the family unit, often inherit behaviour habits. Having a parent with aggressive tendencies could lead to transference of aggressive behaviour to any child, male or female. Equally, an over aggressive caregiver could cause a complete lack of self esteem, leading to withdrawal of that individual, who also lacks the ability of mind to be confident, and bring forth the mental will power required to create mental force. If behaviour habits are so important, what constructs and processes are affected within the brain? Evolution also plays a part in our understanding of mental force and the benefits derived from possessing it, with a direct link to Darwin and the survival of the fittest. Imagine a history where humans did not possess these types of abilities, would we have ever dragged ourselves out of the primeval world that we occupied? There are mental processes that have to be overcome in order for any individual to live a life, to find a mate, reproduce, to survive! To enable this process, the mind as well as the physical body, has to be mentally healthy and fit. As humans, we are constantly under threat from our mind’s activity, we therefore have to understand what is happening when certain moods take over the dominance of our minds, or when we create thoughts that are not congruent with our mental direction. Maintaining the physical body has to form part of this process, ensuring that the body is kept in a state of physical wellbeing will result in a positive attitude, if an individual suffers from a physical impairment, is obese, sleep deprived, lacks nutritional balance, inputs substances into the body (drugs), then the consequence of this is a human organism that is not in balance, the body and mind do not work as one. If the mind was mentally tough and capable of survival and the body was not, it would not take long for one to adversely affect the other, or vice-versa. Therefore physical conditioning should be equally as important as mental conditioning. There is an element of mindful control that has to happen, in order for attention to be exactly that “attention” The brain has to fire its neurons, creating action potentials in the particular part of the brain that is receiving the stimulus; these mechanisms are focused on by the brain and in turn create attention. The amount of sensory input that the brain receives every second of every day is staggering. We see, hear, smell, touch and feel, yet we do not pay attention, until something draws our attention towards a stimulus event “ attention defines the mental ability to select stimuli, responses, memories or thoughts that are behaviorally relevant, amongst the many others that are behaviorally irrelevant” Corbetta, (1998). What is relevant will wholly depend upon the current situation and incoming stimuli, if this happens to be a high stress and emotional one, then attention will be directed in such a way that the bodily responses are congruent with prior thought processes. If there is no link to positive mental processes of mental force then a degrading of attention may occur. While all this is occurring the body’s internal control mechanisms are also working at full tilt, providing even further stimulus input that the brain is having to deal with, without any cognitive awareness. Stimuli from our external senses are not the only way in which attention can be created, close your eyes and imagine something that brings to your mind a vivid picture in your minds eye, a bright red rose, waves from the sea crashing upon a sandy beach, or the face of a loved one. Each time focus is attended to, through conscious will power, attention can be maintained and your neural network jolts into life. Meditation uses just these processes to produce physical changes within the body. For years, before the invention of machines that could measure and record brain activity such as Functional Magnetic Resonance Imaging (FMRI), Computerized Tomography (CT) or Positron Emission Tomography (PET), meditation was viewed as some kind of mystical activity, with no real substance or evidence of the processes that were taking part in the brain. Now we have evidence of the regions of the brain being engaged, when the mind takes control of attention and focuses on internal or external experiences “several studies have investigated the functional anatomy of covert visual orienting to simple unstructured peripheral stimuli. These studies have shown that a specific set of frontal parietal regions are consistently recruited during visual orienting” Corbetta (1998). Covert and overt visual orienting according to Corbetta are two distinct ways in which we explore our visual environment, by saccadic eye movements that happen naturally “overt” or by volitional attention or reflexively when a stimulus appears in our visual field “ covert”, the latter being the process when a sudden unexpected threat arises. A simple example of this could be an incoming punch; attention has to occur focusing mental force to deal with this threat. Corbetta, M. (1998) Frontoparietal cortical networks for directing attention and the eye to visual locations: independent or overlapping neural systems? Proc. Natl. Acad Sci. USA, Vol. 95, pp. 831 – 838, Febuary 1998 Colloquium paper. James, W. (1890). The principles of psychology. Autherised Dover edition published (1950), first published by Henry Holt & company (1890). Schwartz, J. M.D. and Begley, S. (2002), The Mind and The Brain. Neuroplasticity and the power of mental force. Regan Books, an imprint of Harper Collins Publishers. Following on from February’s blog here is part two, what I have attempted to do here is convey the understanding that some ideas should be thoroughly examined before we take them as fact. If the above was not enough evidence there are some that take the basic idea of CRT and expand it to use a doubling rule. In citing this rule they believe that every decision over and above your first choice will double the time taken to react. A simple piece of mathematics will help us here. Choosing between two choices takes approximately 300 milliseconds (ms), add another choice and we get 600ms, another 900ms, another 1 second, 200ms etc – you get the concept I’m sure. What we have is 1.5 seconds to choose between 6 choices, if this were the case, then not only would we see a fantastic staggering effect when it comes to most highly skilled sports like motor racing, MMA, tennis, football, the list can go on and on, we would also in all probability not be the dominant animal on the planet today, as those 1.5 seconds to make a choice between 6 strategies and actions would have made us food rather than the hunter. After Hick’s Law came the Power Law of Practice (“PLP”). In 1980, Newell, Allen and Rosenbloom published a paper that explored the subject of practice and the performance improvements that it creates along with the supporting mechanisms that allow the improvement to become embedded in the behaviour of the individual. This research considered the chucking theory of learning as a means to explain some of the outcomes of performance that relies on practice. They wanted to confirm the empirical reality that this law was applicable to learning in general rather than just being restricted to skill. The PLP is usually associated with perceptual-motor skills. Before I move on with their research it’s important to understand a little more about the processes involved in learning skills. The development of perceptual-motor skills begins early in childhood and continues throughout life, providing that the adult individual continues to expand their skill set. There are three stages to this process of development. The first stage looks at what is needed to perform a move or task. This stage requires a certain understanding of the action that is to be learned. At the second stage, practice is required; another term for this could be “training”, where an individual trains a move or sequence of moves over and over again. The final stage is embedding the moves into the subconscious so that they can be performed without having to pay attention to any procedures that need to occur. The aim here is to produce speed and accuracy, anything other than this would revert itself back to stage two. Any hand eye coordinated movements fall into the category perceptual-motor skills, other examples would be body movement and control, which includes bilateral movement, postural formation and control, auditory language skills, visual-auditory skills and any martial based activity would fit into this category. Before any of the higher skill levels can be achieved or worked on an infant must first acquire the basics, which include rolling, crawling, standing, walking, running and so on until they have a good overall control of their body. Once this has been achieved, more advanced skills can emerge, such as running and jumping, catching and writing, these all involve motor skill practice. The next explanation needs to focus on the perceptual side of this equation. Perception is harder to define, as it’s the knowing of how to do something rather than the performance of the skill. Perception skill also has to be separated from intellectual skills, these are generally skills that can be written and defined to allow others to follow the instructions and gain an understanding of how a particular skill is performed. For example, a person could after some explanation write a manual on how to play chess. Now imagine trying to write a manual on how to ride a bike, the general principles could be written down, but the ‘how’ could not. It’s the performance of the ‘how’ part that relates to perceptional-motor skills which cannot be gained by simply reading a description of the act. Once these types of skills are internalized they become part of natural behaviour, in other words the skill becomes an ability, which is performed spontaneously without input from the conscious mind and it’s these highly developed perceptional-motor skills that can be learnt and developed with enough volitional practice. Here we can see the link between the PLP and the perceptional-motor skill ability as over extended periods of time the ability is learned and transferred from a simple motor skill into a perceptional-motor skill. The transference occurs and performance speed increase when practice becomes a habit and not just something that is trained a few times a week and that’s the biggest difference, if an individual is practicing as a result of habitual processes then the behaviour will soon become ingrained, becoming a perception-motor skill. The research conducted by Newell, Allen and Rosenbloom (1980) into the ubiquity of the Power Law of Practice theory did not fit the simple power law. They concluded that there were systematic shape deviations in the log-log space, in their words “ There exists a ubiquitous quantitative law of practice, it appears to follow a power law. That is plotting the logarithm of the time to perform a task against the logarithm of die trial number always yields a straight line, more or less. We will refer to this law variously as the log-log linear learning law or the power law of practice”. To summarize their research they found that the law holds for performance measured as the time to achieve a fixed task. They looked at three learning curves; exponential, hyperbolic and power law. They found that there was a mechanism that was slowing down the rate of learning and those errors in practice decreased with practice and accuracy increased with practice. This was true for different types of learning, which included perceptual-motor skills, perception, motor behaviour, memory and complex routines. This provides evidence that simple basic responses like those that were tested in Hick’s Law, will, along with complex movements, all fall into the category of PLP. It is therefore a mistake to focus on simple movements to the exclusion of complex ones as both have the same learning capacity according to the law of power learning. What is evident from the above is that humans have a capacity to learn complex movements and have protracted capability to remember data. This will help to explain the complicated skills that are involved in sports that have complicated routines like playing tennis, boxing, self-defence systems, or actions like typing, playing chess all involve the ability to learn, memories, practice and over time internalise so that the activity becomes a part of the perceptual-motor skill, no longer requiring complex thought processes to maintain the behaviour. Lets take a look at some more up to date evidence that relates to this work, research by Silva, Cid, Ferreira and Marques (2011) into the attention and reaction time in Shotokan Athletes produced some interesting results. The aim of their study was to analyze the attention capacity and reaction time in Portuguese karate Shotokan athletes. The participants were physically characterised into weight, height, body mass index and body fat mass percentage and evaluated on Simple Reaction Time (SRT), Choice Reaction Time (CRT), Decision Time (DT) and Distributed Attention (DA). What they found was that both female and male participants, when tested for SRT, reacted near to the 300 ms mark and that there was no significant difference between the two gender groups. However both the CRT and the DT indicated a significant difference, which was higher in the Dan and 35+-year group than in any other group. The Dan 35+ group also showed a lower percentage of mistakes. The athletes who had more years of practice and were higher in grade needed more time to react to the stimulus than the younger less qualified individuals, however they made far fewer mistakes in their choices than the other group. Reaction times have been the subject of study for many years, they were first studied by Donders (1868), the results that were obtained showed that a simple reaction time is shorter than a recognition reaction time, and that the choice reaction time is longest of all and it’s this CRT that Hick studied. This brings me all the way back to those that blindly quote a small part of Hick’s Law to justify their simplistic approach to human movement and reaction times, knowing how the human body works and how psychology has helped to explain very complex abilities within the brain enables a logical system to be built. One that allows for the complex ability of the human brain and the highly coordinated ability of the body to move in space and time. Let’s not just sit back and pull the wool over people’s eyes. I have not touched too much on attention, fear or startle reactions that can, in the right circumstances and with the proper training, increase the body’s reaction speed, let alone symmetry or arousal based reactions. So it’s fair to say that we have come a long way since the early tests of Hick and certainly Ockham in the 14th century. Ultimately, simplicity will always be a part of any system, but it does not have to stop there, correct training on stimulus based reactions will get results, scenario based systems will get results, simple techniques, will get results, what matters is how they are trained and what mental processes are engaged in the practice. So let’s not try to rubbish other arts for the sake of another student and another pound, let’s push the boundaries instead and convey knowledge and skill the best we can. Jefferys, W H. and Berger, j O. (1992) Ockham’s razor and Bayisean analysis. American Scientist. Vol. 80. No 1 (January-February 1992), pp. 64-72. Published by Sigma Xi, The Scientific Research Society. Cohen, N. Poldrack, R. Eichenbaum (1997) Memory for items and Memory for relations in the Procedural/Declarative memory framework. Psychology press, an imprint of Erlbaum (UK) Taylor & Francis Ltd.
By exploring the theory of psychological speed, I do not mean speed of thought, however that is a symbiont part of the theory. What I want to explore here is how an understanding of speed can help with a physical application of movement. The key to moving fast is to understand how the human body engages itself in this process. In previous writings I have looked at Bilateral asymmetrical movement, now I want to introduce the thought process, that which is termed psychological speed. The first determining part of any movement is the central nervous system, which is made up of the brain and the spinal cord, from these all human movement is initiated, controlled and monitored. The next step in controlling movement is the peripheral nervous system, which constitutes every nerve outside of the central nervous system. This system itself has several sub-systems; the one that I am concerned with here is the autonomic nervous system. This system is the one humans use every second of every day of their lives and without any cognitive thought. It controls functions such as heart beat, breathing and initiates many of our reflexes. It is used when we run, drive, swim and many other normal everyday activities, this is the one system that takes an effort to become aware of. The control of this system and movement undertaken by it can all be categorised as spontaneous actions. When we use our minds to interact with this system, introducing a conscious thought process, the moves produced by this interaction are faster than any other conscious movement, as they are embedded in the subconscious mind and controlled by the automatic nervous system. Can you recall a time when a stressful situation occurred and time seemed to slow down? Your mind is working so fast that you are able to think many moves in front of the next. This is the same type of experience that I am exploring here. The body and mind can be trained with certain moves in such a way that speed of movement can be increased. The key here is the ability to take a specific movement out of your subconscious, put it into your conscious mind, analyse it, practice it slowly, and then over time return in back into your subconscious, so that it becomes spontaneous. This type of spontaneous movement is the highest skill level of any martial artist, regardless of style. This is where the essence of true psychological speed exists. Assume that you find yourself in a position where you are able to hammer-fist strike an attacker’s groin. Your next move from the hammer-fist is a rising elbow to underneath their jaw. The first consideration here is the reaction of your attacker after the hit to the groin. assume that your strike is perfect and it has caught them in the ideal spot, they are now entering a reflex action. If we study the action caused by the strike to the groin in this manner, what we will find is that the body does not travel backwards, also the hips are not forced backwards. What happens when a true reflex occurs to this stimulus? – the body collapses upon itself, the knees give way, and depending upon the amount of force, the body will drop to the ground. The initial strike and your attackers reaction are what is known as the ideal phase, everything is working perfectly. Your next planned move is the rising elbow, it’s simple to believe that this can be executed without any problem, however this is not the case if your attacker has innately entered a reflex to pain. They will be moving spontaneously and at a very high-speed. Your next planned move has to be equal to or faster than the attacker’s reflex reaction. At this point psychological speed can be employed. You have to know your next move, your attackers reaction to the move and already be thinking ahead of it. This is achieved by focusing not on the elbow rising or on the elbow returning down from the strike, but on the position of the hand before the move has even began. The point of origin of the elbow is the position at the point of contact to the groin. The elbow needs to move up and then down, returning to its original position in a split second. If you can train this thought process into the execution of the move, you will be able to move at a lightning speed, which is as fast as your attacker’s pain reflex. As the elbow is lower than the jaw they will meet and collide quickly. This type of collision can be termed an initiated collision. You are causing the attacker to move in such a way that they collide with your strike. The key here is that you understand how speed is developed. By inserting into the above move another asymmetrical movement with the other moving limb, bilateral symmetry will be achieved, imagine how fast you will be able to move! There are a wide diversity of situations when psychological speed can be used, within the context of a martial application, my intention from the above is to introduce some ideas that will help the student discover circumstances when this can apply. Can we still perform while under stress? Walter Cannon first coined the term “fight or flight” in 1915, since then it has become linked with combat arts, door supervisors and just about every martial artist. Most know and teach an understanding of the adrenal dump and the effects that this has on the human body when in a fearful or stressful situation. Being stressed and in fear are two different psychological and physiological responses. Stress is something that is hard to put your finger on and can come in varying degrees of severity. It is linked to Homeostasis. The concept is that it’s a system that regulates itself and the human body is one such system, it has controls and mechanisms in place to maintain the ideal operating environment within. Anything that affects the balance of this system can cause stress, for example, you find yourself getting hot, and are unable to remove clothing, your body temperature spikes and you start to feel stressed, not fear. Fear is an emotion, one that is experienced when danger is perceived. This would usually mean an individual being in immediate danger of attack or death. This emotional response leads to two basic choices, stand and fight, or turn and run. It is at this time when the stimulus causing the fear could be so intense, that it triggers a freeze response rather than a flight one. All very natural protection mechanisms that the human body has at its disposal to protect itself. There is also a precurser to fight or flight, posturing and submission, I have already discussed these a little in previous blogs. Experiencing either fear or stress, is a state of arousal, one that can have a significant effect on performance ” Learning the psychological techniques to manage stress not only reduces discomfort but can enhance performance, (Asken, (2010) page 51). An understanding of these states of arousal can help an individual to identify the cause and cope with the effects. Training in specific methods can reduce these effects and is something any serious martial artist should consider. There is a long list of stress/fear symptoms, these could be categorised into three basic areas. Internal mechanism disruptions, these include; raised heart rate, perspiration, increased breathing rhythm, loss of bowel control, sensory inhibition, these are only a few, I am sure that you can think of more. Physical disruptions, these include loss of body coordination, vision, hearing impairment, death grip and freezing. Mental disruptions, including increased anxiety, slow down in mental problem solving, loss of environmental awareness. There are many more than those listed above, however they give a clear understanding that the body is subject to a cause and effect relationship to certain stimuli. All this has an overall effect on the bodys performance levels. The next question should be, if this is the case how can we counteract this? Experience is nothing more than a constant exposure to stimuli and circumstances, that leads to knowledge of what may happen and has happened in the past. This said, coping with a state of arousal is no different, the more you are exposed to it the more habituated you become. Every time you experience high stress you draw from episodic memories, these are the ones that you do not forget easily, even though you may want to sometimes. To enable you to start to cope with these feelings and emotions you need to train in techniques that will help to level out the experience “Semantic and episodic memory together make up the category of declarative memory, which is one of the two major divisions in memory. The counterpart to declarative, or explicit memory, is procedural memory, or implicit memory. The term Episodic Memory was coined by Endal Tulving in 1972. He was referring to the distinction between knowing and remembering. Knowing is more factual whereas remembering is a feeling that is located in the past” (Wikipedia http://en.wikipedia.org/wiki/Episodic_memory (2012). Techniques for managing a high state of stress/fear. There are a great deal of techniques that can be used to manage stress. These range from the most common, breathing techniques, to visual imagery, mental associations, word association. Taking the time to learn to use at least one can be of great benefit to performance under stress. For hundreds of years there have been meditative techniques used to calm the mind and control the body. By taking a breathing technique and renaming it to something more adapt to modern combatives, allows for practitioners to accept it as part of the training required to increase and control performance while in a high state of arousal. Hyperventilation is a state when the body is going into shock over something it perceives as a threat. If while in this state the person experiencing the shallow increased breathing can be settled and encouraged to concentrate on their breathing and relax, to take in oxygen, in slow deep breaths, often they come down and control both the physiological responses as well as the mental ones. As well as there being adverse effects that help protect the human organism, there are also natural responses that heighten the body’s reflexes and senses, its important that these are also understood. This usually happens when the body receives a stimulus that is sudden, unexpected and severe. Increased auditory awareness, Visual clarity, quickened perception and awareness, slowing of time, mental processing increase, all seem to increase the body’s ability to move and survive. What we see here is a clear difference in the bodies reactions to stress. In research conducted by Leavitt (1972, 1973) he linked heart rate to performance, at 115BPM he noted deterioration in fine motor skills, 145BPM deterioration in complex motor skills and at 175BPM a catastrophic failure in cognitive processing capabilities. Relying on this research would lead to a conclusion that once heart rates reach 175BPM it’s all but over, however recent research has shown that rates of this amount and higher, have been recorded while individuals are involved in a high stress encounter, they have been able to process exceptional perception and show increased physical capabilities. ” stress induced heart rate increase in the area of 145 bpm, there is a significant breakdown in performance. But this is not true for everyone. Apparently, if you have practised the skills extensively, you can ‘push the envelope’ of condition Red, enabling extraordinary performance at accelerated heart rate levels” (cited by Grossman (2004) page 34). The difference between the two groups is marked, the latter group able to perform at the highest level of stress. What is it that allows individuals to cope and perform at these high levels? put simply its experience. Experience within this type of environment means continued repetitive exposure to the stimulus that creates the high level of arousal. Do not however fall into the trap that a job automatically gives experience, take any job where exposure to high stress stimulus occurs, for example, police officer, prison officer, army soldier. It’s not hard to imagine that these jobs will result in high stress exposure, why is it then that, so many individuals in these types of occupations fall victim to physical and cognitive shut down? Its experience! or should I say lack of repetitive exposure to direct experiences of the stimulus’ that creates the ability to perform at high levels of stress and continued repetition of the skills required during a situational occurrence. Even though you may have an occupation that is high risk, unless you have constant exposure to a high stress stimulus, you will fall foul of high heart rate stress disorientation. In other words experience is gained through constant repetitive exposure to stimulus that create stress. Having put forward the ideas above and the effects of experience, we need to transfer this to the training that occurs within any discipline. Creating experience is therefore very important. Post traumatic stress disorder (PTSD) is a fairly recent disorder first diagnosed in soldiers returning from war. If however we look at this disorder from another angle, what we may find is, that PTSD is more common than we may think. For example take the term ‘traumatic’ this is an event that effects someone emotionally creating a long-term episodic memory. This can be any event in an individual’s life that they perceive as traumatic, children are much more likely to experience an event that causes trauma than an adult, adults trauma is usually much more heightened. Post this event the individual feels stress whenever they are exposed to situations that recreate the original traumatic event. Add the disorder label and we now have PTSD from events that could be seen as normal daily occurrences or an evolutionary mechanism designed to protect the human organism, heightened in some creating fear and stress. For example take any fear or phobia, lets say the fear of spiders! every time a person sees a spider, they get so stressed that it creates very real feelings of fear, are they experiencing a form of PTSD? having at some time in their past had a traumatic experience with a spider or is it an evolutionary adaptation, or maybe a little of both, learned and inate. Understanding the reasons for stress/fear and the effects that it can have on performance, should then give us the knowledge to train in a manner that encourages constant exposure to stimulus that induces stress. This is not as easy as it seems, it may be easy for some that are more inclined to heightened experiences, however experiencing real danger is hard to replicate in a normal training environment. The most reliable way to avoid the effects of stress/fear on performance is to create experience, in doing so we also have muscle memory, muscle memory is spontaneity of movement, not having to think about your responses to certain events. This has to be engrained so that performance at high levels of stress induced heart rates can be maintained. Can the human body perform under stress? Imagine yourself captured by terrorist, tied to a chair in a room, a team of special forces explode into the room guns blazing, life in the balance, do you want them to spray the room and hope for the best or pick their targets, in doing this action do you think they are operating under high stress? What makes them capable of these actions? and why can’t you have similar control? Do you lose motor and mental control? Yes, if you are not trained and experienced! and there in is the key, trained and experienced. So how does this help the mainstream martial artist? Mindset and understanding are two of the hardest elements to teach within the arts. There is a saying ” you react in the street, the same way you train in the school” or something similar. Training realistically and in a manner that creates reactive spontaneity, is a key to effective defence. Experience is something that needs to be obtained, experience of efficient repetition, experience of your own emotions and feelings, experience of dealing with internal and well as external mechanisms. Knowing what your body is doing and why is the first step to creating coping strategies, which will enable effective and controlled responses when performing under a high emotionally induced stress situation. Asken,M,J,phd & Grossman, D, Lt. Col. Warriors mindset (2010) Warrior Science Publications. Wikipedia, http://en.wikipedia.org/wiki/Episodic_memory, updated 4th December 2012 at 19:54. Accessed on 06-12-12.